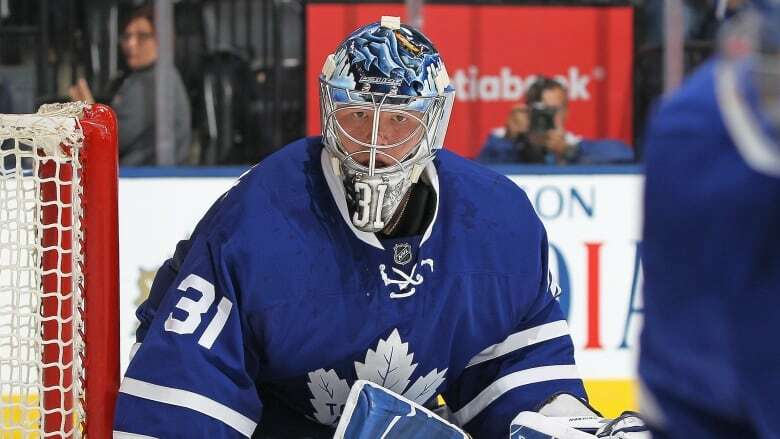 The Toronto Maple Leafs will be without starting netminder Frederik Andersen when they host Florida on Tuesday night. Curtis McElhinney has been around the NHL for almost a decade, but he couldn't recall a single start that carried the implications of the one which lays ahead of him and the Toronto Maple Leafs. The 33-year-old will start Tuesday night when the Leafs host the Florida Panthers as No. 1 Frederik Andersen is sidelined at least one game — and perhaps more — with a mysterious upper body injury. Andersen had to exit a Saturday loss in Buffalo after just a period, returning to take part briefly in practice on Monday morning. When he returns is uncertain. The team listed him as day-to-day with further evaluation ahead of Tuesday. "We don't know," Andersen said of a timeline. "It's tough to predict, but we're taking it slow. Felt pretty good today, but I'm taking it one day at a time." With eight games left over the final 13 days of the regular season, beginning against the Panthers, the Leafs don't have much time to delay with the cloudy injury. Neither the team nor Andersen would pinpoint exactly what the ailment was, only that he was "bumped" early in the 5-2 loss to the Sabres and felt "a little bit off" afterward. The offending incident appeared to come two minutes and 30 seconds into the opening frame as Sabres forward William Carrier bumped heads with Andersen after being shoved by Leafs centre Brian Boyle. Andersen fell awkwardly to the ice, but remained in the game for the ensuing 17-plus minutes. The Dane discussed his uncomfortable status with the team's medical staff as well as the Sabres doctor in the intermission and "just decided to play it safe" by coming out. He offered a murky response on whether he was suffering from concussion-like symptoms: "No. No, I don't want to get too much into that stuff. We just want to make sure I get back in the net as quick as possible." Andersen missed four games with a concussion late last season while still with the Anaheim Ducks and another one in Feb. 2015. The NHL instituted new protocol this season which allows for players to be removed from game action if they exhibit symptoms associated with a concussion. Leafs coach Mike Babcock said it was "doctor's protocol" that had Andersen removed. "The beauty about the injury department around here (is) I'm not in charge," Babcock said. "It makes it easy for me. They tell me when the guy's back. They told me he wasn't available today, but things are real good." Andersen's absence, even for a game, hurts the Leafs as the tenuously hold on to the third playoff spot in the Atlantic division. Not only has Andersen been among the NHL's top-15 goaltenders this season (.918 save percentage in a career-high 61 games), but he's been especially hot of late, posting a .936 save percentage in March. McElhinney has been fine in limited duty with the club (.919 save percentage), but has made his career in the league strictly as a backup. His .906 save percentage since 2007 ranks 54th of the 62 goaltenders to play in at least 150 games (Andersen is tied for 13th). Columbus placed him on waivers, tellingly, in early January. The London, Ont., native didn't sound too overwhelmed by the ensuing moment though, describing his upcoming start as just like any other. He was even hoping to find redemption against the Panthers, who pegged him for four goals in relief earlier this month. "It's no different than any of my other starts outside of it's not a back-to-back," said McElhinney, whose sole duty with the Leafs previously came on the second night of back-to-back sets. "It'll be a good experience." "He's done a good job for us and we like him," Babcock added. "We need him to find a way to play like he's capable of. That's all we need." The Leafs will get a boost to their forward depth at the very least, with promising Finnish rookie Kasperi Kapanen due to join an increasingly injured fourth line.